I have an interesting and unique axe on my "available" page. I'll post some pictures here, but the fascinating story behind this axe can be found here. It is rather long to read, but I think you will agree it is well worth spending the time to read about it. It is not everyday that something like this comes along. Beautiful workmanship on the axe and an amazing story! Do you have a photo of the original axe? What do you mean Ken? That is the original axe! There is not an exact original that I drew inspiration from. I looked at a number of Wheeler Type IV axes, then sort of let the creative juices flow in the forging. Great work Eric, I really like this one! Great story too. I love it too! And the Danish axe in the other concurrent post. I haven't worked myself up yet to buy a quality axe (as I'm still in love with swords) but I am really enjoying your recent posts on this topic. Maybe you have found your niche? What I notice from your work is that very subtle subtle elements in the angles and curves of the head (or body?) and even the haft make the difference between a prosaic weapon and a piece of functional art. By the way, some of your comments, like the right way to tighten up the head on the haft and testing your axes, brought back pleasant memories from my youth of chopping down trees and practicing throwing axes against the woodpile at my parent's cottage, imagining I was some ancient warrior. May many more little old ladies leave you their priceless family heirlooms. That is a gorgeous axe! I love the bowed haft. Everything about it is just so good. Well done Eric! My only question is, will you send the buyer some brownies or cookies too...? LOL! What? 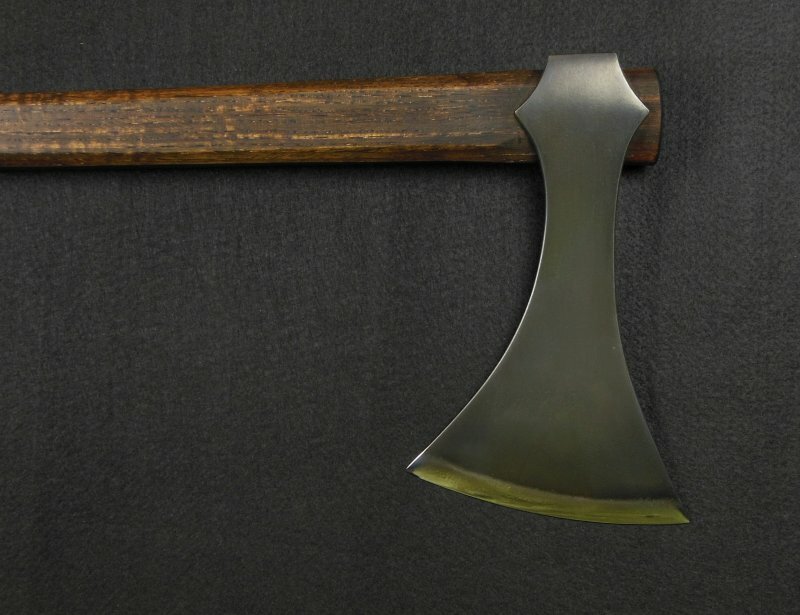 You don't believe this is one of the best preserved axes in history? Sometimes you just have to have a little fun to break the monotony! A beautifully clean a slick axe Eric - really good work. Thanks Tod! The encouragement means a lot. I guess I need to make this clear since I have received a number of emails from people who are thinking that I am presenting an axe that was possibly made 1100 years ago. 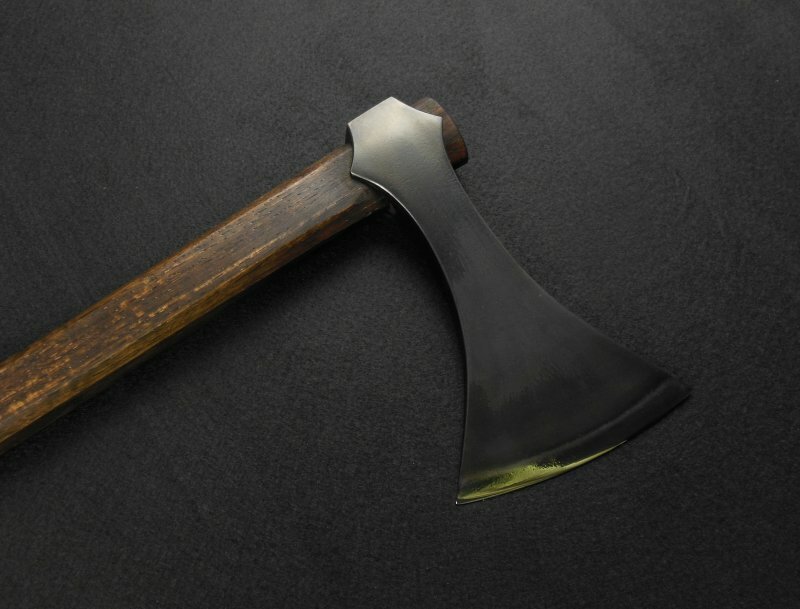 I hand forged this axe last month. This is completely my work. I was just trying to make an interesting backstory to accompany the axe. Pieces are often presented without any historic context, so I thought I'd supply a bit of historical fiction to help bring this axe alive. There was no intent to deceive or try to pass off this axe as an actual antique. I apologize for the confusion. I will still keep the backstory since I had fun writing it, and I think it adds substance to the piece. I like the historical fiction... I just suspect that, especially in writing, one needs a punchline to squarely put it into the right context. I also received messages about it. I was ... surprised. Well, I will use more caution next time...if there is a next time. I thought I provided enough clues to allow people to know that it was fiction without ruining the story, but apparently that was not the case. I still think there is benefit in trying to provide historic context through story telling with these pieces. That is a discussion the another time. Well, I will use more caution next time...if there is a next time. Ahh don't worry about it too much, I thought it was fun and you even fooled me for a couple seconds Great axe and story in my opinion. Thanks for the kind words. Honestly, it was fun writing the story. I love Bernard Cornwell, so that is where I was drawing inspiration. I'll likely do something like it again, but put something at the beginning like, "the story that follows has been completely fabricated." Well, I will use more caution next time...if there is a next time. I thought I provided enough clues to allow people to know that it was fiction without ruining the story, but apparently that was not the case. Glad you tried a smaller axe, it turned out great. Well done. I enjoyed the story, gave me a good chuckle. I did think to myself, I wonder how many people will think this is real...? I guess there's one born every minute! He had me wondering until I looked at the condition of the axe vs. the price!